Running for president may delay that a bit, he added. Democratic presidential hopeful Pete Buttigieg announced that he and his husband are planning to have a child soon. Buttigieg, the mayor of South Bend, Indiana, revealed their plan at a rally in Brooklyn on Monday, just one day after he officially launched his 2020 presidential campaign. Buttigieg, often referred to as "Mayor Pete," made the reveal while answering questions about his views on paid family leave, an issue he said he has a "personal stake in." (Justin Sullivan/Getty Images) Democratic presidential hopeful South Bend, Indiana mayor Pete Buttigieg speaks at the Commonwealth Club of California, March 28, 2019, in San Francisco. "We're hoping to have a little one soon, so I have a personal stake in this one, too," Buttigieg said. "We should have paid parental leave and find a way to have paid leave for anyone who needs caring." 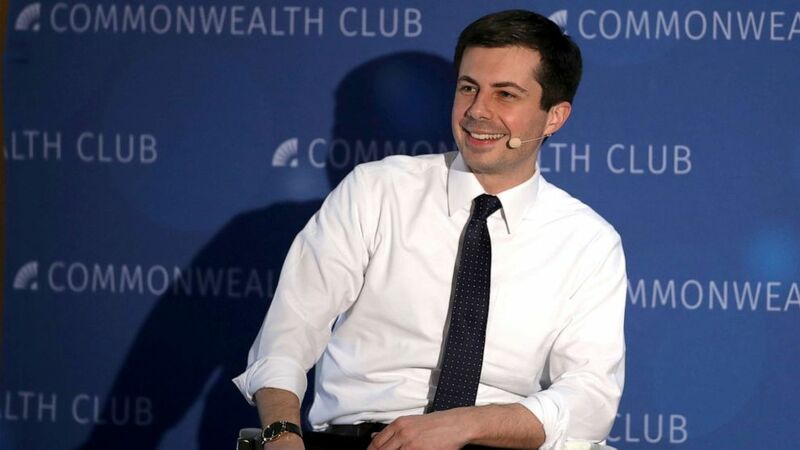 Buttigieg, 37, expanded on his plans with his husband, Chasten, in an interview with MSNBC late Monday, noting that his presidential campaign had slowed down their trek to fatherhood a bit. "This running for president has slowed down the path," he told MSNBC. (Bizuayehu Tesfaye/Las Vegas Review-Journal via AP) South Bend, Ind. Mayor Pete Buttigieg flashes a thumbs-up as he prepares to depart after speaking at a meet and greet event on Monday, April 8, 2019, in Las Vegas. 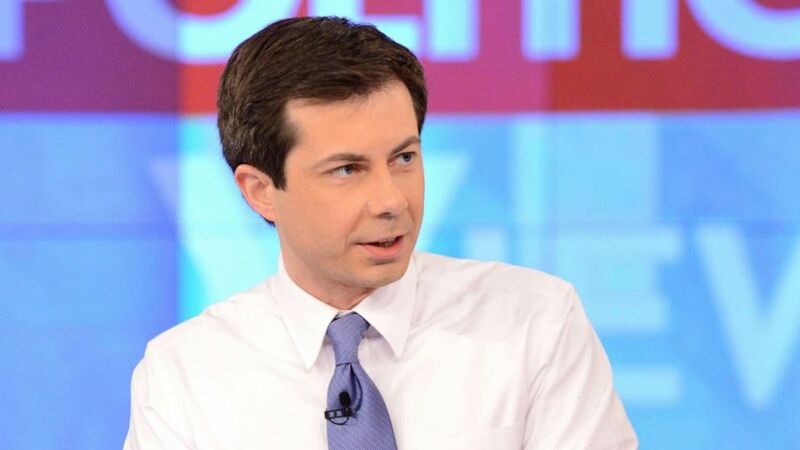 (Lorenzo Bevilaqua/ABC) Mayor of South Bend, Ind., and Democratic presidential candidate Pete Buttigieg visits ABC's "The View" on Jan. 31, 2019. "My husband, he is made for a lot of things. He is a great educator. He has become a great public figure, coming out of the gate," Buttigieg added. "He is going to be an amazing father. I can't wait to see -- I hope I will be good at it, too. I can't wait to see him have that chance." 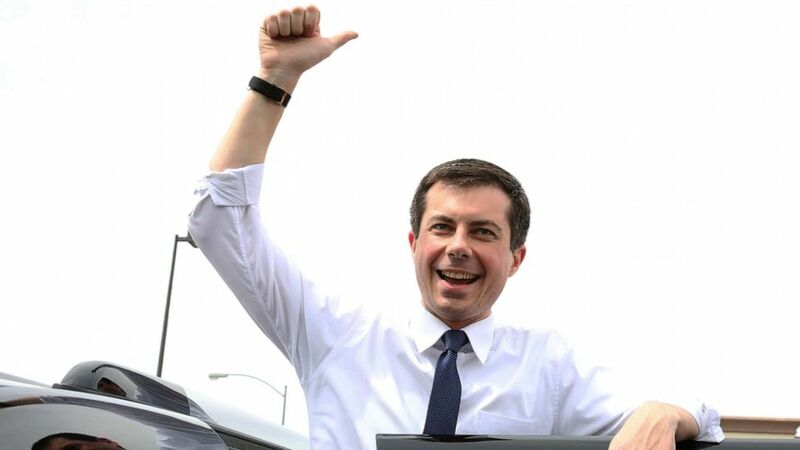 Chasten Buttigieg, a 29-year-old high school teacher at a South Bend Montessori school, has matched his husband's emergence over the initial months of the 2020 election season with his own prolific Twitter following and candid takes from the trail. It's not lost on me that I was able to marry the man I love by the grace of one Supreme Court vote. The couple married in 2018 at the Cathedral of Saint James Episcopal Church in South Bend. Chasten recently spoke about his newfound fame at an event hosted by the Human Rights Campaign and the significance of his husband's historic candidacy. "I now live in a world where people take photos of me in the deodorant aisle at the grocery store," he said. "It's not lost on me that I was able to marry the man I love by the grace of one Supreme Court vote." Mayor Buttigieg, a Rhodes scholar and Afghanistan War veteran, would be the country's first openly gay nominee from a major political party. He doubled down on that criticism on Tuesday on CNN's "New Day" saying “The vice president is entitled to his religious beliefs... My problem is when those religious beliefs are used as an excuse to harm other people." ABC News' Christopher Donato contributed to this report.